In order to increase its legitimacy as worldwide accounting standard setter, the International Accounting Standards Committee (IASC) reformed in 2001 its due process of standard setting with the purpose of instigating a more widespread constituents’ participation in terms of stakeholder diversity and geographical diversity. Using a multi-period/multi-issue research design, this study sets out to analyze whether constituents’ participation changed after the reform in comparison to the period before the reform. An analysis of 7,442 comment letters sent to the standard setter over the periods 1995–2007 reveal that conclusions are different according to the topic on the agenda of the standard setter. Constituents’ participation with regard to financial-instruments-related issues did not change after the reform. These topics always generated widespread interest from all corners of the world and from all types of constituents. Participation in response to non-financial instruments-related proposals, increased after the reform, especially due to a much more active participation of constituents from G4+1 countries. 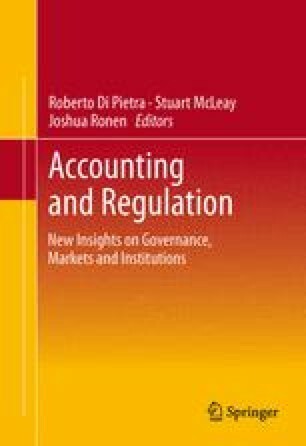 This chapter includes the paper originally titled “Lobbying toward the IASB: A multi-issues analysis of participation in the due process of standard setting” and discussed at the Third International Workshop on Accounting and Regulation in 2007. Financial Crisis Advisory Group (FCAG). (2009). Report of the financial crisis advisory group, consulted at 26 June 2012 at http://www.ifrs.org/nr/rdonlyres/2d2862cc-befc-4a1e-8ddc-f159b78c2aa6/0/fcagreportjuly2009.pdf. Financial Stability Forum. (2009). Report of the financial stability forum on addressing procyclicality of the financial system. http://www.fsforum.org/publications/r_0904a.pdf. Accessed June 2010. G20. (2009). Declaration on strengthening the financial system. London 2 April 2009. http://www.g20.org/Documents/Fin_Deps_Fin_Reg_Annex020409-1615final.pdf. Accessed Dec 2010. High-Level Group of Financial Supervision in the EU. (2009). Report http://ec.europa.eu/internal_market/finances/docs/de_larosiere_report_en.pdf. Accessed June 2010. MSCI (2012) Index Definitions. Available at http://www.msci.com/products/indices/tools/. Consulted on 10 May 2012.